For lunch we went out to a restaurant a couple blocks from where Fanpop works in San Francisco - Primo Patio (Google Maps). 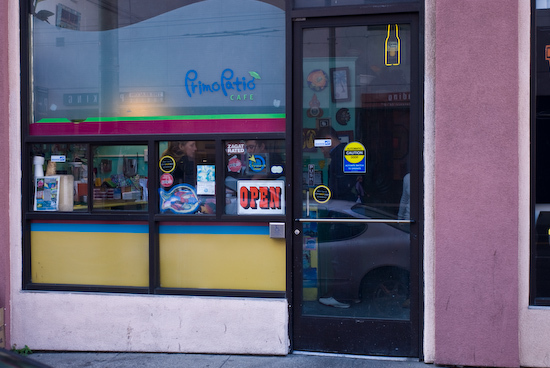 I've made this comment before about many restaurants in San Francisco, but their front door (like that of Hard Knox Cafe) is easily missed, even when walking on the sidewalk right past the place. I had a dentist appointment (routine cleaning) today so I decided to take the precaution of not eating a full lunch before my appointment (I had a messy mishap triggered by my extreme gag reflex about 15 years ago…). 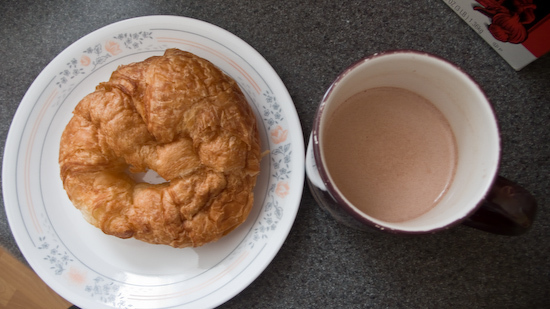 I started the day with a Costco croissant (microwaved for twenty seconds) and a cup of Swiss Miss hot chocolate that I found in the pantry. I had lunch with my friend Harold and his son Blake at Tasman Teriyaki (Google Maps) in Santa Clara. 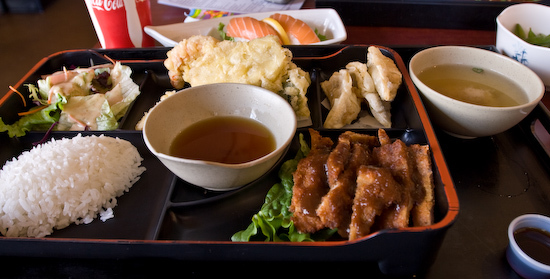 I ordered the bento box combination #2 (with gyoza instead of California rolls) with tonkatsu (pork cutlet) and tempura. I also ordered an addition of sake (salmon) nigiri. I almost forgot to take a picture of my lunch. When I did remember to pull out my camera, I found (upon removal of the lens cap) my filter shattered. My camera must have experienced some impact or trauma that I wasn't aware of in the previous few hours. 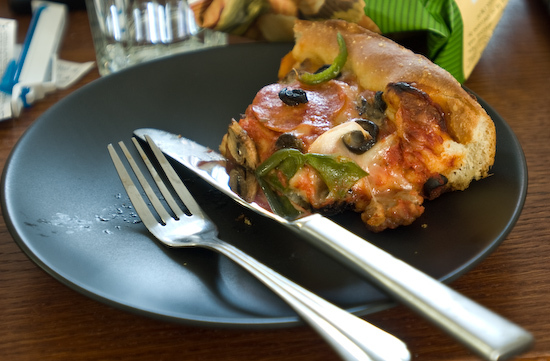 After cleaning up the glass, I took a picture of what was left of my Pizza Chigaco pizza slice that I had been eating. 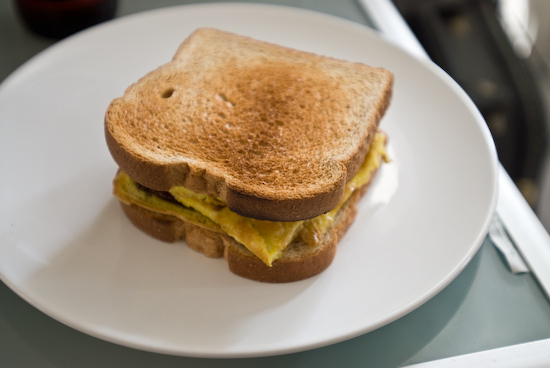 I started the day off by making myself an egg and bacon sandwich using whole wheat bread toasted in the toaster oven, beating two eggs and frying them in a non-stick pan, and heating up a couple slices of bacon that I had cooked before. After church, Tina and I ate with our friends Pete and Vickey and their two youngest kids Susanna and Joseph at the Palo Alto Pizz'a Chicago (Google Maps). We ordered a large "The Fridge" and a large cheese pizza. 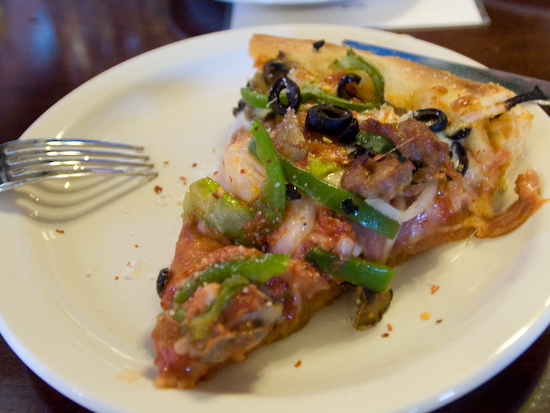 I ate a couple slices of "The Fridge" which is a deep dish potato crust pizza with a combination topping. 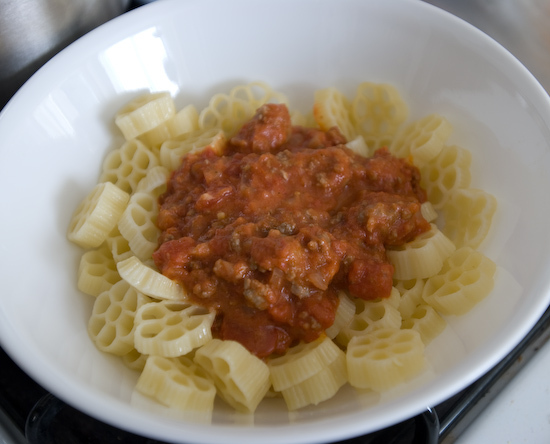 I had more of the ruote with meat sauce for lunch. Looks like there's only one more meal of that left. 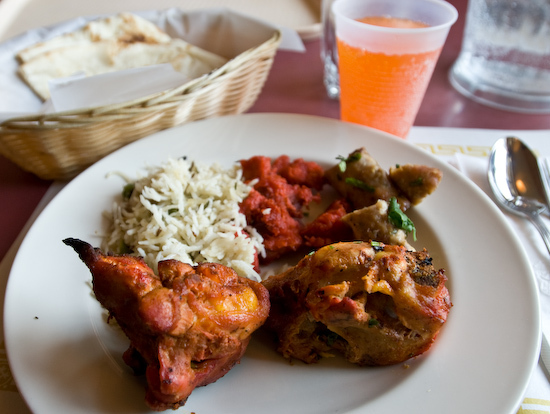 I had lunch with my friends Harold and Fred at Mayuri Indian Cuisine. It was buffet, so I chose foods that were not as spicy as I normally would go for since I didn't want to upset my stomach. I went for a dish called Chicken 65, Tandoori Chicken, a lamb kebab thing that I normally get, and some pilaw on my first pass. 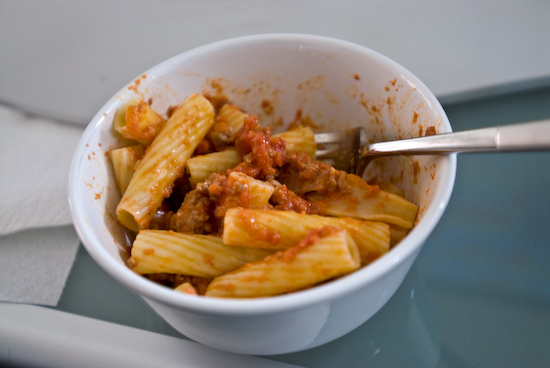 For my lunch meal, I ate some rigatoni and meat sauce (reheated in the "office" microwave). Had it at 2:00pm and at 4:30pm. I woke up late this morning and spent a lot of time contemplating how I was going to run the soft-boiled egg test that's been on my mind for weeks. I actually planned to do it today, but with a bunch of errands stacked up and a new feature to deliver on Fanpop, I just didn't have any time to spare. For lunch, I started off with a bowl of the capellini with olive oil and garlic that I still have in the fridge.